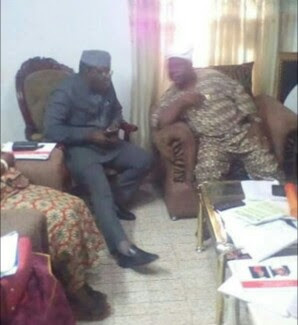 Kayode Fayemi, governor-elect of Ekiti state, on Tuesday led some members of the APC to the residence of Iyiola Omisore, SDP candidate in Osun state governorship election. APC's visit comes 24 hours after that of Senate President Bukola Saraki. The PDP and APC are wooing Omisore ahead of the rerun. The rerun will hold in seven polling units across four local government areas — Orolu, Ife north, Ife south and Osogbo. Ife is the stronghold of Omisore. Ademola Adeleke of the PDP had polled 254,699, while his closest challenger, Isiaka Oyetola of the APC had 254,345 votes. Although all the 48 political parties will partake in the exercise, the contest is between Adeleke and Oyetola. While receiving Saraki on Monday, Omisore listed the conditions under which he would work for any of the two leading parties. He had said, “I have given my programmes to both the APC and the PDP. My programme is like this; payment of salaries and pensions. Good governance is what is important to me.